As why did the roar of a few solitary WWII Vintage Airplanes taking off from Paine Field this past June make me smile over that same symphonic sound those 'Ol piston-powered Hydroplanes used to emanate! Having left off this streaming Roostertail wake 'O vocabulary upon No Fenders inside our local Unlimited Hydroplanes museum, some dozen-plus years ago, I'm happy to have discovered that they've since increased Thar Rolling Stock, for which you can get a good idea of their current Hydroplane Armada from their Restorations tab upon their website. Continuing our most enjoyable Walkabout thru the facility with Ron, presumably the Hydroplane & Raceboat Museum's Curator, He said they’d fix up the Bud', aka the 1980 U-1 Miss Budweiser Hull I'd been Drooling over Real Good once again. Noting it just needed some cosmetic work to the cowlings which are fiberglass along with mechanical repairs. I asked if the hull was fiberglass? Its aluminum honeycomb. Ron replied I should know because I helped glue the hull together! I also helped the painter. Then I casually told Ron how I’ve been a lifelong Budweiser fan while my Dad was a Pak devotee. Before asking does the museum have any Pay ‘N Pak's? Then I mentioned that I wanted to view the display cases hidden against the wall behind the Miss Bardahl. We looked at the few Hydroplane models in differing scales, i.e. ; Miss Thriftway and the Slo Mo Shun V, along with helmets and other items while Ron gave my Dad a running commentary on the models. An excellent large scale model in a solitary display case caught my attention. Although I didn’t recognize the hydro while at the museum, afterwards I seemed to remember the Miller High Life boat better. I believe this turbine powered boat was campaigned by Jim Lucero and was the boat to beat in the mid-80’s. As I suspect this model was the 1985 boat driven by Chip Hanauer. And it was the 1st turbine powered hull to win a National High Points Championship. Go-ahead and play with any of the controls. You turn the steering wheel and drive the boat. With my left foot wedged against the dead pedal and my right on the gas pedal I joyously proceeded to give the steering wheel a few turns! I noticed how both of my knees were against the steering wheel and Commented on this to Ron. Mentioning how I couldn’t imagine driving in anger like that. Ron then explained how just like racecars the cockpits were configured to fit the actual drivers, which implies they were much smaller. Then I asked Ron about the lack of seat belts, what instruments were on the simple dashboard and if the windscreen did any good? Ron remarked how early on a driver with seat belts had flipped his boat and drown to death! while the few instruments were typical racecar style, i.e.,; Tachometer, Oil & Water pressure. With the most important being the Oil Pressure warning light. When that goes off you “shut her down” immediately! After reluctantly climbing out of the U-1 Miss Budweiser's Spartan cockpit, navigating past a few tables laid out, there was still birthday cake leftover from the evening before Ron’s fathers birthday, who’d worked on the Slo Mo Shun V.
Behind the tables across from the Slo Mo was a late 1960's or early '70's? Oh Boy Oberto resting vertically from its trailer. As the Oh Boy Oberto became famous locally with the likes of Scotty Pierce & Chip Hanauer at the controls. Whilst alongside the Oh Boy Oberto resided an early 1980’s Atlas Van Lines. Which Ron explained how they'd managed to acquire the original trailer for the boat. Everything except the transporter which caught fire during one racing season. When I casually mentioned "Blue Blaster" Ron immediately corrected me, saying that this was Chip’s boat, not the Blue Blaster. In deference to the Bud being known as the Beer Wagon, Bill Muncey's Atlas Van Lines were nicknamed the Blue Blaster's. Ron then told us how the museum had recently received permission from Bill’s wife Fran Muncey to restore his boat to running condition. As apparently we had missed seeing this boat, hidden outside. Unfortunately a sponsor is needed to fund the project. Before Ron explained how excess materials left over from current restoration projects were being saved for use on the boat’s future restoration. The museum was currently restoring the Miss Hurricane IV. While Ron also enthusiastically mentioned how the Miss Thriftway was being restored on Vashon Island. Standing next to the Atlas, I was completely overtaken by the paint scheme. As the blue paint is an excellent colour, making it easy to understand how the nickname was definitely appropriate. We decided that this was a good time to "Exit Stage Left!" And leave. Thus we said our goodbyes as Ron returned, thanking him very much for the guided tour. While my favourite hydroplane will forever be the Miss Budweiser. Unfortunately after 41yrs of sponsorship from Anheiser-Busch and the demise of Bernie Little, The Bud ran its very LAST race that very same October of Twenty-oh-Four. Just one month prior to our initial museum visit. As Budweiser has decided to focus its marketing dollars on RASSCAR'; GROAN! Therefore, with that said, you'll probably be surprised by My top-3 picks for hydroplanes on display. As Numero Uno Hands-down is the black scallop nose trim metallic green dragon Miss Bardahl. "Chip's Boat," the U-00 Atlas Van Lines was runner-up with the Rolls Royce Griffon Miss Budweiser taking the final podium step. Chip Hanauer, who at the time I thought was tied with the late Bill Muncey as Unlimited Hydroplane Racing’s winningest drivers (62 victories apiece) would be inducted into the International Motorsports Hall of Fame in 2005. Fellow inductees joining Chip's class included: Na$car’s ‘ole Boogity-Boogity-Boogity DW. (Darrell Waltrip) Drag Racing's Bob Glidden & Joe Amato and 'Ol Bloody Nige! Nee "Il Lione" or simply "Red 5." As in the one and only world famous Thespian, the 1992 Formula One World Champion, and '93 CART/PPG IndyCar champion Nigel Mansell. As that's an Uber' Stout grouping 'O legendary Drivers to be inducted with! 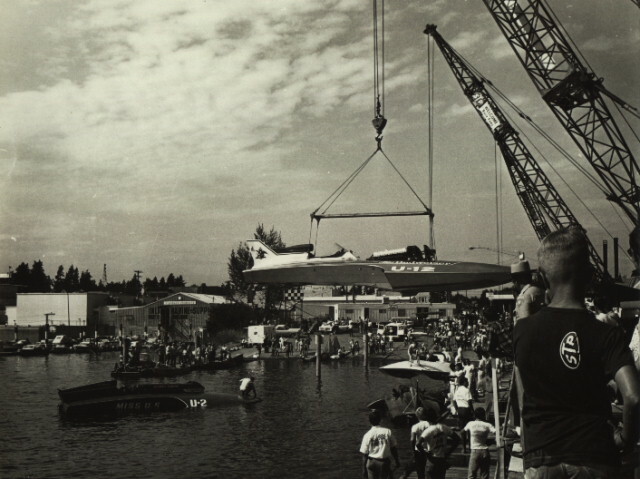 Although I've subsequently learned that Chip Hanauer is actually just the third winningest Unlimited Hydroplane Driver. As his arch nemesis and Miss Budweiser successor, the Dastardly Dave Villwock currently holds the record with a staggering 67 victories. Followed by the late Bill Muncey's 62, with Hanauer P3 with 61 W's. As I pilfered the two images for this story from a totally unheard of website, which Y'all should really check out, since it's got a ton 'O great photographs!